The provincial government budgeted $7.5-million in federal funding last year for the Trans-Labrador Highway. Slight problem: The federal government didn't. Nor did the Money Bunny do so this year. 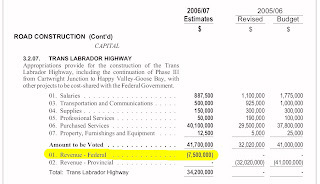 So, how, legally and constutionally, does the provincial government get off voting itself $7.5-million in money that is not only not theirs, but which doesn't even exist?